Developed by Dan Smith Studios and published by Ripstone, The Spectrum Retreat is a first-person puzzle game with an emphasis on narrative. Players are invited to “uncover the mysteries of The Penrose hotel” and “solve mind-bending color-coded puzzles” in order to do so. 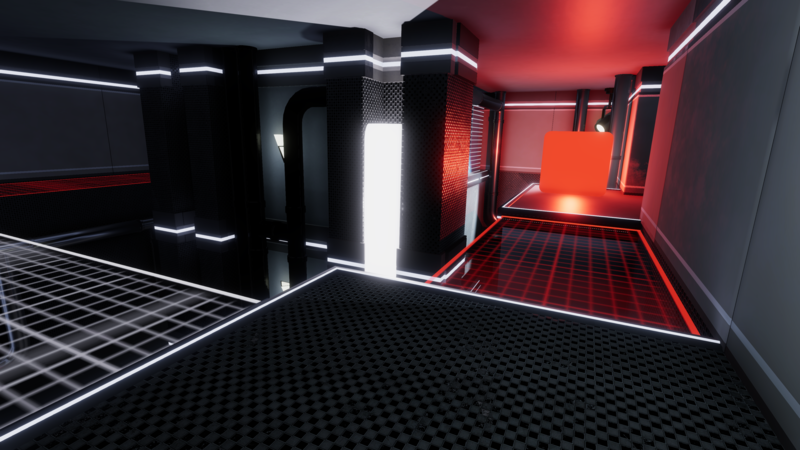 Prior to its release, the game had been compared to Portal in terms of feel, level design, and logic. Having played through the campaign, I can confidently say that while the inspiration for Portal is clear, the execution doesn’t come close. The Spectrum Retreat has satisfying puzzles with just the right amount of challenge, but the narrative is where the game starts to tear at its seams. Narrative is a complicated thing, because what resonates with some fans will not resonate with all. However, I’m a firm believer that a good story is recognized by all. That being said, I don’t think The Spectrum Retreat creates an intriguing story, but I’m sure some players will find it captivating. The game begins with you, Alex, waking up in The Penrose Hotel. Shortly after beginning your day, which always involves breakfast at the restaurant downstairs, you receive a phone call. On the other end is a person named Cooper who explains that they’re going to try and get you out of this hotel and that your memory is effectively gone. You discover early on in the game that the Penrose Hotel is a digital hotel meant to be the ultimate vacation (because it’s a simulation and can in turn be “perfect”). To escape the hotel, Cooper tells you to go floor by floor. Each floor has a room full of color-coded puzzles that you need to solve to essentially hack your way out. The story is given to us in sporadic, vague pieces. This is meant to create suspense, but because I don’t feel invested in Alex at all, the initial mystery only serves to confuse and annoy me. Additionally, there’s no real build up here. All of a sudden you’re just told that you’re trapped and need to follow a set of directions from a voice you don’t know. I don’t buy or care for this. And while most of our information comes from Cooper, you can deduce a lot of it yourself by taking your time to explore The Penrose Hotel during the early hours of the game. The in-game collectible “logs” also give you insights into what’s going on in this world. This is a nice touch but constructing the narrative, especially early on, feels too much in the hands of the player. In short, it takes effort to get into the story. The Spectrum Retreat’s narrative tries too hard to be intriguing and deep. It plays like a bad episode of Netflix’s Black Mirror (a comparison that will surely excite some and polarize others). Without giving too much away, the story evolves to include a lot related to healthcare coverage. It’s a powerful topic, but it’s not explored well. It’s sort of the running theme of this game, story-wise. There’s so much happening in The Spectrum Retreat‘s narrative that none of it sticks. It feels like they’re throwing motifs at the player in the hopes of creating depth merely by including the topic at all: technology, betrayal, trust, parenthood, healthcare, corruption, etc. It felt poorly stitched together. As a result, I found myself just wanting to get back to the puzzle-solving gameplay. The Spectrum Retreat will satisfy those who love isolated, laboratory style puzzles. The gameplay isn’t revolutionary, but it is satisfying and rather intuitive. Everything centers on color. Alex’s item, that he uses to interact with the world, is a circular cellphone that allows him to transfer colors between glowing blocks. Each area is full of colored barriers and your job is to execute color transfers in the right order/places so that you can advance to the end of the level aka reach the elevator (hence the Portal parallels). The controls are rather simple as a result, which keep everything streamlined. Most of the game can be played with just the analog sticks and back triggers. Things start off a bit dull, but once you get into a rhythm it’s wonderful. Each floor introduces additional characteristics to the level design or the mechanic itself so that the gameplay always feels fresh. By the end, the levels became lush puzzles with many moving parts to consider. Throughout the levels are glowing objects clustered together that represent your memories. For instance, you may stumble across a sofa, TV, and a coffee table with hospital bills on it. This is meant to marry the gameplay and narrative, but it didn’t do much for my understanding and often got repetitive (how many bills do we need to see?). These moments remind me that The Spectrum Retreat is a good puzzle game inside a weird story/a weird story infused into a puzzle game. It’s a mostly enjoyable time, but there are a few moments I take issue with. Once gravity shifting is introduced, things become rather sloppy. There were several moments of the game where I found myself spinning or falling somewhat aimlessly as I tried to move myself and the camera. For some reason when you’ve shifted gravity, moving the camera can cause you to fall. I feel like there should’ve been something in place to make the gravity shift more stable. If that wasn’t technologically possible, I think the mechanic should’ve been removed and replaced with something less finicky. Lastly, one of the most frustrating elements of this game is the fact that it’s possible to become stuck within a level (i.e your attempt to solve the puzzle can make it unsolvable). The game accounts for this by proving a restart challenge option in the menu, but an undo button would’ve been useful. This didn’t hinder my enjoyment too much, but there were a few times where I felt frustrated because I had to do the entire puzzle again after making one small mistake near the end. Did I enjoy my stay? Overall, I would have to say not really. The puzzles themselves are this game’s saving grace. I didn’t have a bad time playing it, but I can’t recommend it in good faith. If you’re a huge puzzle fan, like me, there’s something here for you. But in all honesty, there are plenty of puzzle games out there that wouldn’t come with this big of an asterisk. Go play those. All of that said, a player’s reaction to the narrative and hub world is going to be the big deciding factor for whether or not you think this game is good. The narrative and gameplay combined together detract from the experience of one another, resulting in something decent at best and eye-roll inducing at worst. The Spectrum Retreat really went for it, but a swing and a miss is still a miss. The Spectrum Retreat was a review copy provided by publisher. Version 1.00 played on a standard PlayStation 4. For more information on scoring please see our Review Policy here.